Pictured above, the lobby wall at NTS Camden, Arkansas. 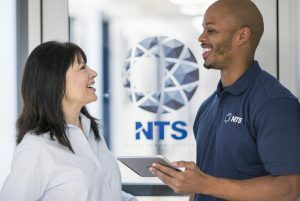 NTS has always been a partner of the Defense Industry, and a large part of our commitment stems from a very deep and personal relationship with members of the United States military. 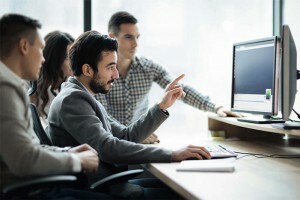 This connection is shared by all the NTS employees working on numerous military programs that come through our doors. NTS Camden, the flagship facility for defense programs, not only provides the best quality of service to our military programs but is proud to recognize their sacrifices as well. 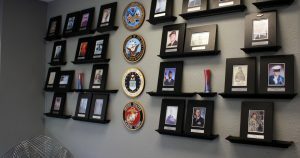 Upon entry into the reception area at our facility, each visitor and employee is greeted by an inspiring and humbling display of the pride that NTS holds for its role in the safety for each member of the US military. The seals for the branches of service and military photos of NTS employees and their family members cover the south wall overlooking the lobby entrance. These portraits span a long period of American military history, representing officers and enlisted from the Army, Navy, Air Force, and Marines dating as far back as the Civil War to the present day. NTS greatly values the personal connection of knowing that through both destructive and nondestructive testing we help to ensure that those who serve in the United States military have quality products to protect them as they willingly put themselves in harm’s way to defend their country.